In this article i will explain about what is Pivot and why we need to use Pivot in SQL server. I will explain this by comparing group by and pivot in the same scenario for better understanding of Pivot. Pivot is use for convert or transform row level data into column data. 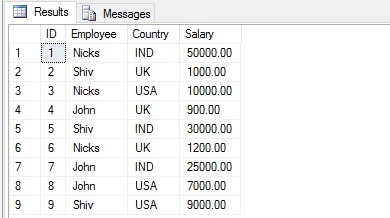 Many time when we working with dynamic queries and also in our simple scenerios we need to display our row level data as column level, for this we use Pivot and for performing just opposite operation SQL provides another keyword Unpivot. In other words pivot rotates you rows into columns and unpivot rotates you column into rows again. Data of my table is not in a readable in first look and we need to do some calculation onto it. What happend if i want total of perticular employee salary based on their respective Country. So here i am using Group By clause to do this operation. 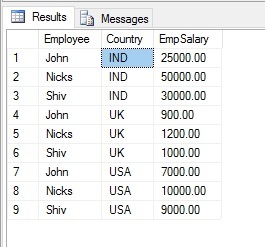 It is clearly shown that we transform our row data country names as new columns.